Predictions about the future are always risky. Admittedly, no one has a crystal ball. Regardless, if we do not try to forecast the future, there is no doubt that we will be caught off guard as we strive to protect this experiment in democracy that we call America. 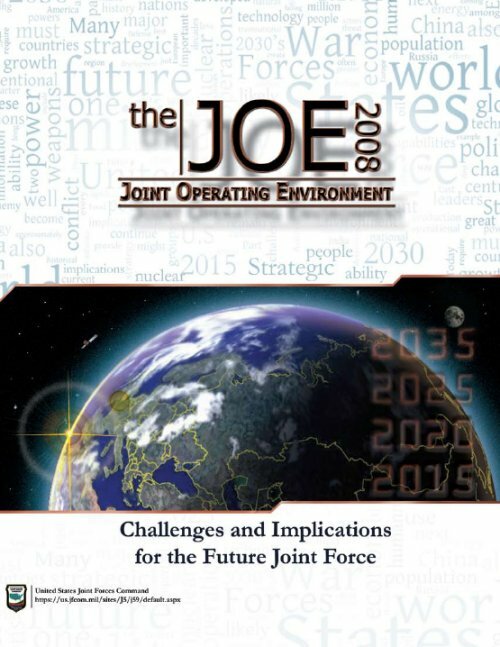 The Joint Operating Environment (JOE) is our historically informed, forward-looking effort to discern most accurately the challenges we will face at the operational level of war, and to determine their inherent implications. We recognize that the future environment will not be precisely the one we describe; however, we are sufficiently confident of this study’s rigor that it can guide future concept development. While no study can get the future 100 percent correct, we believe it’s most important that we get it sufficiently right, and that the daunting challenge of perfection not paralyze our best efforts. When future war comes, our concept developers across the Armed Services should have the fewest regrets if today they study, challenge, and implement solutions to the security implications defined here in the JOE. In our line of work, having the fewest regrets defines success when the shocks of conflict bring the surprise that inevitably accompanies warfare. America retains both the powers of “intimidation and inspiration.” We will continue to play a leading role in protecting the values that grew out of the wisdom and vision of our nation’s original architects. We must be under no illusions about the threats to our shared values, but we must also recognize the military as only one, albeit critical aspect of America’s strength. This strength must specifically recognize the need to adapt to the security challenges we face, whether or not the enemy chooses to fight us in the manner that we would prefer. America’s military cannot be dominant yet irrelevant to our policy makers’ requirements. As the JOE goes to print, we face a challenging set of circumstances. The JOE maintains a longer term view and avoids a preclusive vision of future war. Any enemy worth his salt will adapt to target our perceived weaknesses, so the implications contained in this study cannot be rank ordered. But the implications do serve as the basis of the companion Capstone Concept for Joint Operations (CCJO), which outlines how the Joint Force will operate in the future. 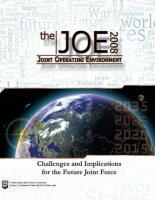 If the JOE serves as the “problem statement,” the CCJO serves as the way the Joint Force will operate in the future to “solve” the problem. These two documents should be seen as two parts of the whole. In a field of human endeavor as fraught with uncertainty as war, it is essential that we maintain an open mind in our approach. Our responsibility is to turn over this military to our successors in better condition than we who serve today received it. We encourage criticism of our work. We plan to update the JOE routinely in response to your input. Creativity in technological development, operational employment, and conceptual framework is necessary, and it’s our intent that the JOE inspires an openness to change so urgently needed when both highand low-intensity threats abound. The next quarter century will challenge U.S. joint forces with threats and opportunities ranging from regular and irregular wars in remote lands, to relief and reconstruction in crisis zones, to sustained engagement in the global commons. During this time, the causes of conflict will vary from rational political calculation to uncontrolled passion. Our enemy’s capabilities will range from explosive vests worn by suicide bombers to long-range precision-guided cyber, space, and missile attacks. The threat of mass destruction – from nuclear, biological, and chemical weapons – will likely expand from stable nation-states to less stable states and even non-state networks. It is impossible to predict precisely how challenges will emerge and what form they might take. Nevertheless, it is absolutely vital to try to frame the strategic and operational contexts of the future, in order to glimpse the possible environments where political and military leaders will work and where they might employ joint forces. The value of such efforts lies not so much in the final product, but much more in the participation of senior leaders and decision-makers in the discussion. Only by wrestling with the possibilities, determining the leading indicators, and then reading the signposts of the times will the Joint Force have some of the answers to the challenges of the future. The alternative, to focus exclusively on the here and now or to pass this mission to the bureaucracy, will certainly result in getting caught flat-footed, reacting to near-term crises as they arise, at great cost in blood and treasure. Thinking about the future requires an understanding of both what is timeless and what will likely change. As Thucydides suggested in the fifth century BC, “the events which happened in the past… (human nature being what it is) will at some time or other and in much the same way be repeated in the future.”2 Many features will not change. The challenges of the future will resemble, in many ways, the challenges that American forces have faced over the past two centuries. In spite of the current intellectual climate in much of the developed world, conflict will not disappear. War has been a principal driver of change over the course of history and there is no reason to believe that the future will differ in this respect. Neither will the fundamental nature of war change. War will remain primarily a human endeavor. In contrast, changes in the strategic landscape, the introduction and employment of new technologies, and the adaptation and creativity of our adversaries will alter the character of joint operations a great deal. Here too, the past can suggest much about the future – the nature of change, its impact on human societies, and the interplay among human societies in peaceful and warlike competition. While much will stay the same, change will also continue to be a driving force in human affairs. One cannot rule out the possibility that U.S. military forces will be engaged in persistent conflict over the next quarter century. In the next twenty-five years, there will continue to be those who will hijack and exploit Islam and other beliefs for their own extremist ends. There will continue to be opponents who will try to disrupt the political stability and deny the free access to the global commons that is crucial to the world’s economy. In this environment, the presence, reach, and capability of U.S. military forces, working with like-minded partners, will continue to be called on to protect our national interests. Merely sustaining the health of the Joint Force, never mind adapting and transforming, is far more complicated in a period of persistent conflict, with its toll on equipment, people, and national will. The nature of the human condition will guarantee that uncertainty, ambiguity, and surprise will dominate the course of events. However carefully we think about the future; however thorough our preparations; however coherent and thoughtful our concepts, training, and doctrine; we will be surprised. Even the wisest of statesmen have found their assumptions about the future confounded by reality. The eighteenth century British leader, William Pitt, the Younger, declared in a speech before the House of Commons in February 1792: “Unquestionably there has never been a time in the history of our country when, from the situation in Europe, we might more reasonably expect fifteen years of peace, than we have at the present moment.”3 Within a matter of months, Britain would become embroiled in a conflict that would last nearly a quarter of a century and would kill more Europeans than any other war in history up to that time. What future trends and disruptions are likely to affect the Joint Force over the next quarter century? How are these trends and disruptions likely to define the future contexts for joint operations? What are the implications of these trends and contexts for the Joint Force? By exploring these trends, contexts, and implications, the Joint Operating Environment provides a basis for thinking about the world over the next quarter century. Its purpose is not to predict, but to suggest ways leaders might think about the future. If war at its essence is a human endeavor, then it follows that one of the most effective ways to understand human nature is by a close consideration of history. As such, rather than futuristic vignettes, the Joint Operating Environment uses history as a principal way to gain insight into the future. The discussion begins with the enduring nature of war, the causes and consequences of change and surprises, and the role of strategy. Part II then describes some trends, discontinuities and potential trouble spots that joint forces may confront. Part III analyzes how these trends and disruptions may combine into contexts that will likely define joint operations over the next quarter century. Part IV describes the implications of these contexts for the Joint Force as it confronts an uncertain future. This section also suggests how senior leaders might think about creating a force that is suited to address the challenges that these contexts will present. This is the unique contribution of the Joint Operating Environment to the broader discussion about the future. Before concluding, Part V offers some “leading questions” about topics that may fall outside the traditional purview of this study, but that nonetheless have important implications for the future Joint Force. We will find ourselves caught off guard by changes in the political, economic, technological, strategic, and operational environments. We will find ourselves surprised by the creativity and capability of our adversaries. Our goal is not to eliminate surprise – that is impossible. Our goal is, by a careful consideration of the future, to suggest the attributes of a joint force capable of adjusting with minimum difficulty when the surprise inevitably comes. The true test of military effectiveness in the past has been in the ability of a force to diagnose the conditions it actually confronts and then quickly adapt. In the end, it will be our imagination and agility to envision and prepare for the future, and then to adapt to surprises, that will determine how the Joint Force will perform over the next twenty-five years. The agility to adapt to the reality of war, its political framework, and to the fact the enemy also consists of adaptive humans, has been the key component in military effectiveness in the past and will continue to be so in the future. 1. Sun Tzu, The Art of War, trans. and ed. by Samuel B. Griffith (Oxford, 1963), p. 63. 2. Thucydides, The History of the Peloponnesian War, trans. by Rex Warner (London: Penguin Books, 1954), p. 48. 3. Quoted in Colin Gray, Another Bloody Century, (London: Penguin Books, 2005), p. 40.